The housing market has not only recovered its pre-recession levels, but some observers are actually starting to worry about yet another housing bubble. Housing prices are on the rise, thanks in large part to extremelytight inventory, so it’s worth asking: are potential home buyers getting priced out of the market? The answer depends on where they live and how much money they make. HowMuch.net collected average home prices for every state from Zillow which we then plugged into a mortgage calculator to figure out monthly payments. Remember, mortgage payments consist of both the principal and the interest for the loan. The interest rate we used varied from 4 to 5% in each state, depending on the market. The lower the interest rate, the lower the monthly payment. To keep things simple, we assumed buyers could contribute a 10% down payment. Another thing to keep in mind is that financial advisors commonly recommend the total cost of housing take up no more than 30% of gross income (the amount before taxes, retirement savings, etc.). 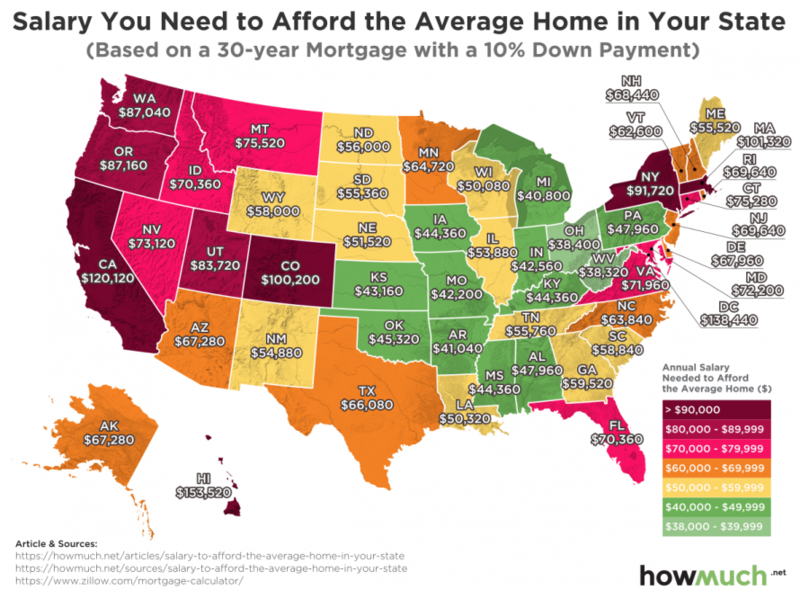 Using this rule as our benchmark, we calculated the minimum salary required to afford the average home in each state. Our map creates a quick snapshot of housing affordability across the United States. There are several pockets in which only the upper middle class and above can afford to own even the average home, most notably across the West and in the Northeast. There are only two states west of the Mississippi River where a worker with an annual salary under $40,000 can afford a mid-level home: Missouri and Oklahoma. Colorado stands out as the only landlocked state requiring a significant amount of income ($100,200), thanks in large part to the housing market around Denver. Homes tend to be more affordable in the eastern half of the country, with a notable pocket of “green” (less expensive) states located in the upper Midwest. The North is generally more affordable than the South and the typical home is significantly easier to buy in places like Michigan or Ohio than in Louisiana or Arkansas. Additionally, our map indicates that workers can more easily afford homes in the East than in the West, which is surprising given how much more land is available out West. It is important to note that there are certainly deep pockets of poverty in all of these places, which suggests that our map obscures the inequality behind averages. The best takeaway from our map is that housing remains affordable in large swaths of the country, even though there will always be places like California and New York where there is simply too much demand for the available inventory. Thankfully, that doesn’t mean that buying a home is suddenly out of reach for average Americans in Ohio or Mississippi, for example.